If the gritty feel of sandstone in your hand excites you like nothing else in this world, you'll love OnePlus for bringing its smartphones and covers' atypical sandstone finish to everyday objects you tend to touch often. Just in time for April 1st, the up-and-about mobile device and accessory maker did some research and found out there are at least four objects that "plague mankind with their slippery nature" – cups, sneakers, soaps, and oh, the iPhone 6s! 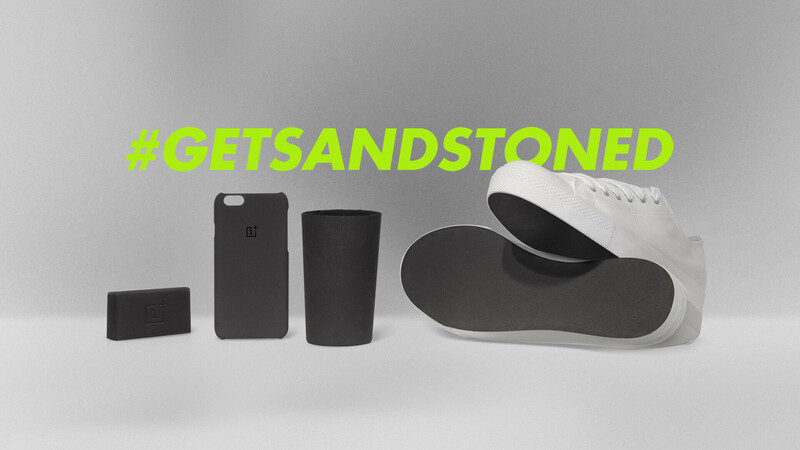 Assembling a crack team of scientists and anti-slip specialists, OnePlus worked painstakingly to introduce the notoriously non-frictional sandstone element to these common objects, solving a common design mistake and enhancing their virtues in the process! OnePlus is upping the sandstone game like nobody else in the business! The "extra grippy" Sandstone Cup offers premium security to those with the habit of handling liquids and beverages around their computer or other sensitive electronic machinery. The rough-but-not-uncomfortable material also exfoliates your lips each time you take a sip, keeping them in prime condition. Then there are the Sandstone Sneakers, which OnePlus believes are perfect for delicate use cases like staying on the ground when attempting a roundhouse kick, Chuck Norris-style. Meanwhile, the Sandstone Soap will never slip away from your palms but it will make your skin "as smooth as a baby sea lion" (Nivea should steal this tag line). And finally, the Sandstone iPhone Case, which OnePlus sells "because you know why". Joke's on Apple's tab. Alas, only one of these products actually exists, and that's the Sandstone iPhone Case. The rest are presumably coming out in a parallel universe which most of us here on Earth won't have access to. Such is the way of April Fools jokes. In all seriousness, though, OnePlus is hosting a giveaway for sandstone enthusiasts. Over the next four days, it will be giving away 200 iPhone Sandstone Cases and 200 OnePlus X Sandstone Cases. The contest will end on April 4 23:59 PM EDT, and the rest of the details are available in the company's forums (link). I need that Sandstone Soap and the Sandstone iPhone 6S (is Plus included?) case lol! Sandstone phone cases is not a bad idea at all. I hoped that was real.